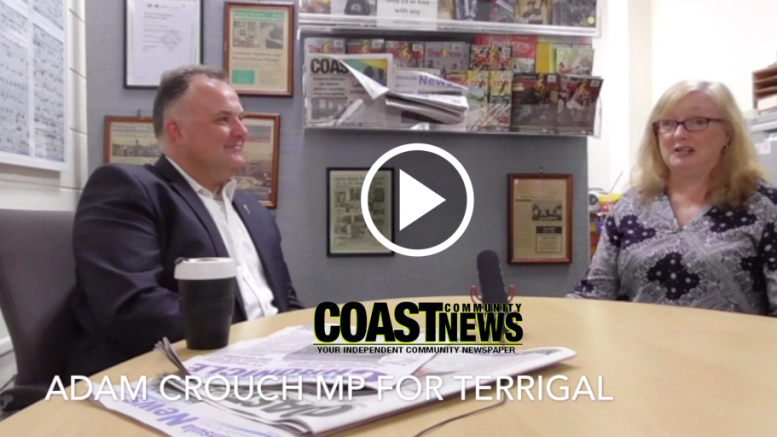 In his first Central Coast Newspapers Video News interview, Member for Gosford, Mr Adam Crouch, talks about why he considers being an MP a dream job. “It was an incredible privilege to be elected,” Mr Crouch said, adding there was “never a more humbling moment. “It is such a privilege and such an honour and not a day goes by when there is not something new to do,” he said, confirming he would be standing as the incumbent Liberal Party candidate in the March 2019 state election for the seat of Terrigal. Mr Crouch said it was not just the big projects, such as delivery of the redevelopment of Gosford Hospital, that he loved but also the little challenges of helping his constituents to solve problems. Mr Crouch spoke about one of his pet projects, the roundabout that joins Avoca Dve and the Scenic Highway at Kincumber and said he was confident the redevelopment of the intersection was on track to commence this year. Twenty-five thousand people use that intersection every day, according to the Member for Terrigal. He said he was proud of the delivery of the scoping work and community consultation which favoured a two-lane roundabout over traffic lights. Mr Crouch also shared his views on the new Central Coast Council, erosion at Wamberal and the redevelopment of Gosford Hospital.